Here in Alberta, we’ve reached a record of consecutive cold days in a row – it’s been below 0 degrees celcius since October 29th! That’s why I’m bringing as much Spring as possible into our home decor so we can trick ourselves into thinking it’s warmer than it really is. 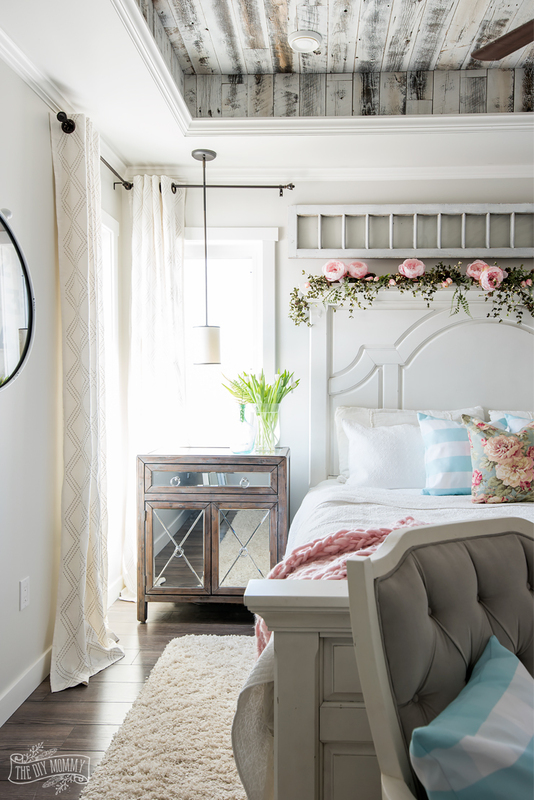 Let me give you a little tour of our rustic & romantic Spring master bedroom decor with some pretty DIY decor ideas for the season! 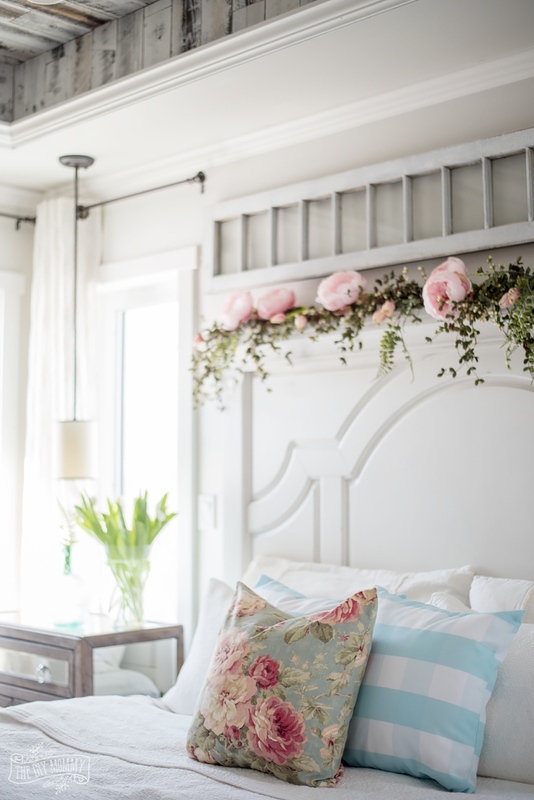 Welcome to our rustic and romantic Spring master bedroom dressed in florals and happy pinks, greens and blues. After a major clean and a tackle of our epic laundry pile, I used things I had on hand to make our bedroom feel fresh and Spring ready! 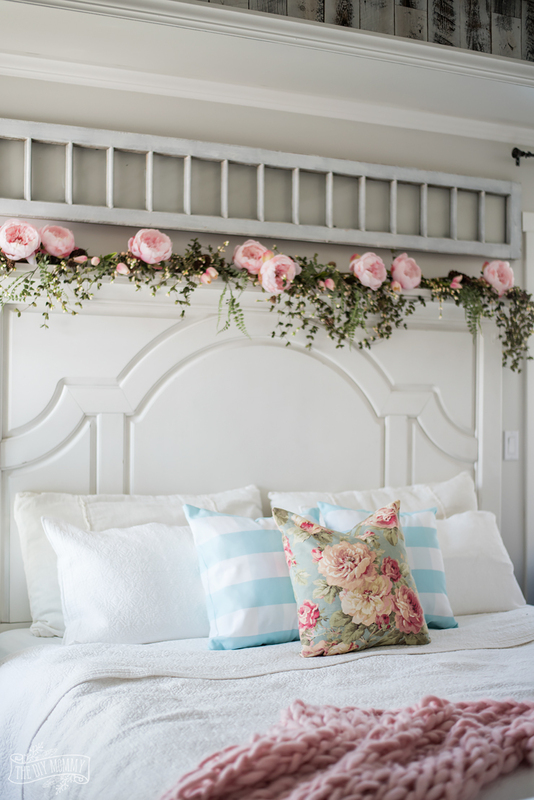 My favourite part is this garland on the headboard. I actually used a Christmas boxwood garland as a base, but I think it looks quite seasonally appropriate by adding some faux peonies, ferns and tulips. I just bent all the stems and pushed them into the garland. I used simple white sheets and a quilt set I found on clearance at Restoration Hardware. 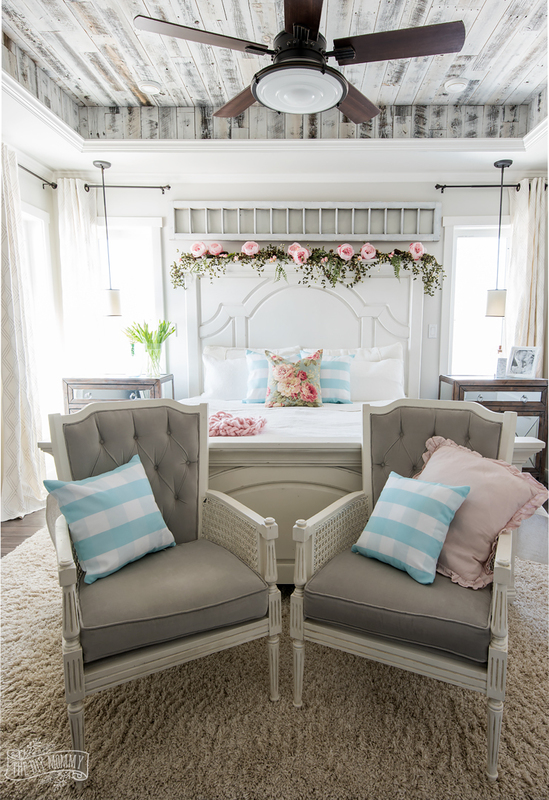 I love the look of layered whites, and some pretty pillows add just the right amount of colour. The aqua buffalo check pillows are from my own pillow collection, and the floral one I sewed with this fabric. A vase of beautiful but inexpensive fresh tulips at my bedside and a DIY arm knit blanket in pink are little details that add so much. Just for something different (and because I like to rearrange furniture as a hobby!) I moved my vintage chair pair to the foot of our bed to see how they functioned and looked there. 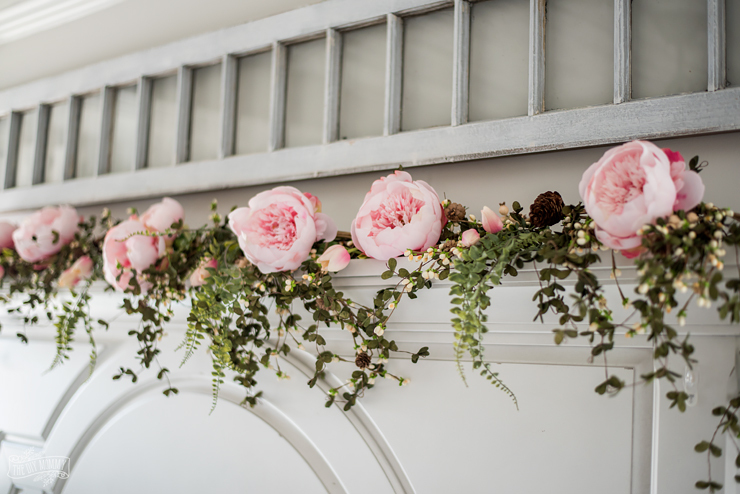 I’m loving this fresh, Spring look that’s a little rustic and a LOT romantic! What do you think? Now, we’re FINALLY working on our master bathroom and I can’t wait to share that with you soon. It’s been 5 years in the making and I’m so happy to be getting it done! 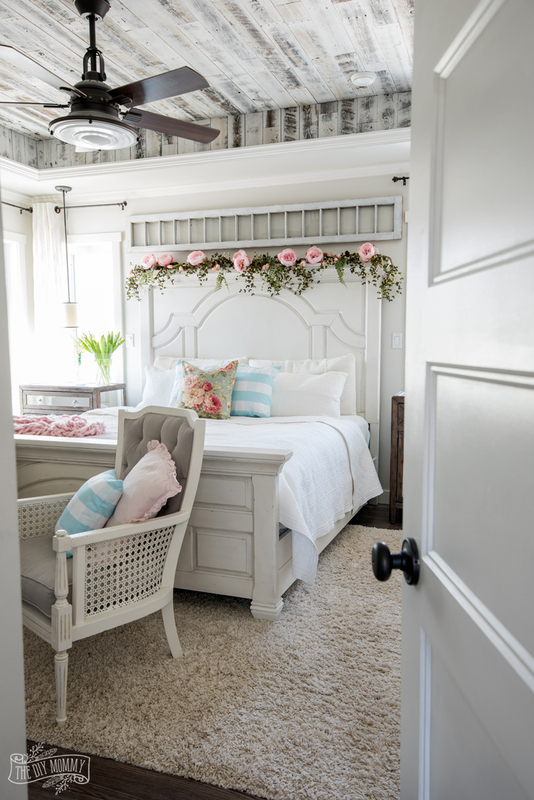 I absolutely ❤️❤️❤️ the garland above your bed. I’m so sorry to hear about your extreme cold spell, I’m not sure how you are able to live through it. 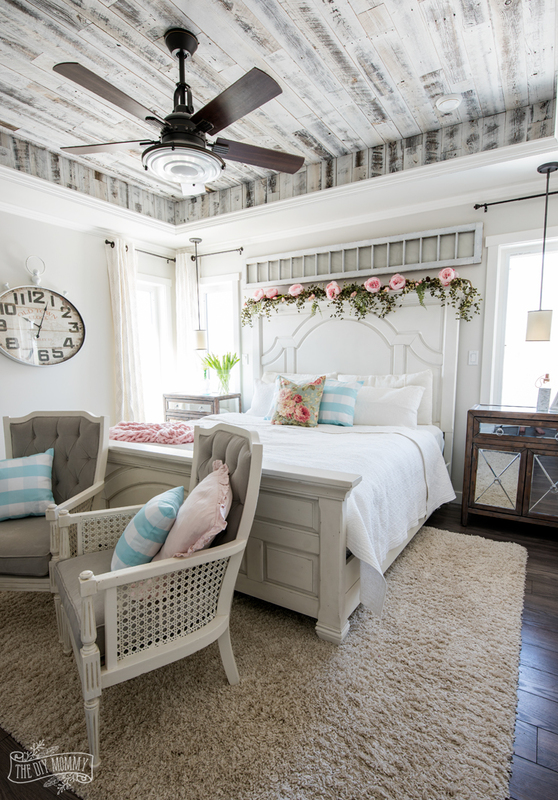 The spring decor in your master bedroom is very cheerful but subtle. Thanks for sharing your talent with us. I like the whole concept of bedroom decor. You have succeeded in bringing the Spring into your bedroom. I love your style! Thank you for posting. I want this bedroom! My husband and I keep talking about what we want to do to our bedroom and I think this will serve as our inspiration! where did you get your bed? I am soooo in love with it! please respond, I seriously need this bed. It’s from the brick 😀 we love it too!